Hi everyone, My name is Irit and I am new here. I drafted a pattern of a shirt+sleeves. When I want to go to DETAIL MODE the software says: “You can’t use Detail mode yet. Please, create at least one workpiece.” Can any one explain what I did wrong? Before you can use detail mode, you have to create a workpiece. You have to use the workpiece tool for this. You need to select your points and curves in a clockwise direction. 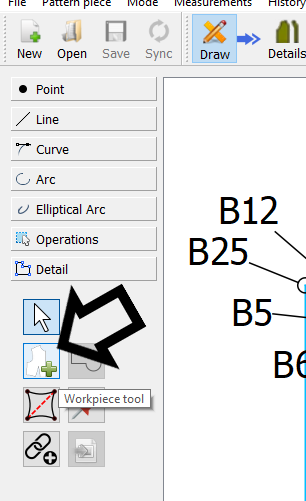 If your curve has the arrow pointing in the other direction, you can use shift to be able to select the curve. Click on ‘OK’ in the box that pops up and you are done. You may now go to the Details board. You may add extra points to the piece, pins and internal paths later by changing back to the Draw board and using the other tools in this tab to select them. By right-clicking on the pattern piece in the Details board, you may click on Options to fine-tune your pattern, add seam allowances, labels, etc. Susan has created a very nice, short pdf tutorial in the banner at the top of the page which gives a very short ‘How to’ on creating a simple quilt square which covers all the steps to creating your first pattern. It’s well worth a read. Hi Grace, Thank you so much for your help - it’s eye opening. Hi Avi, Thank you so much for your clarification! Thanks for posting your issue to the forum. I hope this cleared things up for you. Please keep in touch and post any questions or comments to our community, we’re happy to help!